Albert (Pat) Hollingshead was born in Culloden on March 10, 1890 and grew up south of Ingersoll. On his Attestation Papers he listed his next-of-kin as his father Wm. Edward Hollingshead of R. R. #2 Ostrander, Ontario. He also stated he was single, a farmer and of the Presbyterian faith. 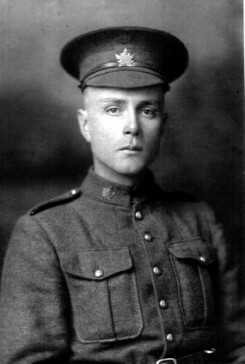 He enlisted on February 16, 1916 in Ingersoll, Ontario. Pat joined the Army and served in Belgium, Holland and France. He was wounded in Europe and gassed at Vimy Ridge. Pat returned and rented a 100 acre farm at Lot 6 Concession 1 in North Oxford. After renting the farm from 1939 to 1942, Pat bought a farm at Lot 6 Concession 2. Pat’s son John (Jack) was killed in action in 1945 in World War II.